What’s the loudest sound you’ve ever heard? A canon? A gunshot? A fire alarm? The screeching of the subway? Have you ever wondered about the loudest sound of all time? No? Just me? OK, that’s fine, but here are 700 words on it anyway. Think, for a moment, just how crazy this is. If you’re in Boston and someone tells you that they heard a sound coming from New York City, you’re probably going to give them a funny look. But Boston is a mere 200 miles from New York. What we’re talking about here is like being in Boston and clearly hearing a noise coming from Dublin, Ireland. Travelling at the speed of sound (766 miles or 1,233 kilometers per hour), it takes a noise about 4 hours to cover that distance. This is the most distant sound that has ever been heard in recorded history. The earth has not come close to replicating that type of sound since. The island of Krakatoa was torn apart, and smoke rose 17 miles into the atmosphere, three times higher than Mt. Everest. The eruption also caused a tsunami with waves over 100 feet high. Between 36,000 and 120,000 people died instantly. A guy named Norham Castle – what a great name – was on a ship 40 miles from the eruption. In his log, he wrote: So violent are the explosions that the ear-drums of over half my crew have been shattered. My last throughts are with my dear wife. I am convinced that the Day of Judgement has come. At 172 decibals, you would be unable to breathe or see from the sound pressure. Glass would shatter. Water in the air would drop out of suspension. It is the same sound that a military stun grenade makes for a split second, if it was right next to your ear. Again, the sound was 172 decibals not at the source or a mile away … but 100 miles away! There is actually a limit to the loudest sound possible in Earth’s atmosphere. It’s 194 decibals. Any louder and the sound is no longer just passing through the air. It is pushing the air along with it, which creates a pressurized burst of moving air known as a shock wave. At Krakatoa, the sound was well over this limit. Here is a video of a recent volcanic eruption in Papa New Guinea. It’s on a much smaller scale, but it gives you a sense of how powerful the shock wave can be from a distance. In the year following the Krakatoa eruption, average Northern Hemisphere summer temperatures fell by as much as 2.2 °F. Weather patterns were chaotic for years, and temperatures did not return to normal until 1888. You might remember the famous “water year” from July 1883 to June 1884 when Los Angeles received 38.18 inches of rain. This was attributed to the Krakatoa eruption. The eruption darkened the sky worldwide for years afterwards, and produced spectacular sunsets throughout the world for many months. 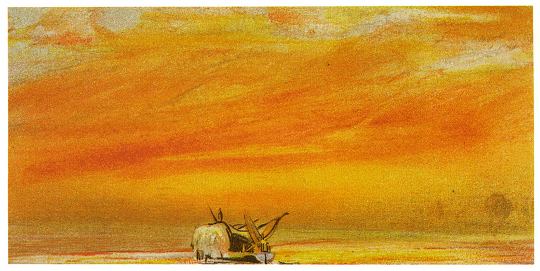 A British artist named William Ashcroft made thousands of color sketches of the red sunsets in the years after the eruption. Look at this! The ash caused “such vivid red sunsets that fire engines were called out in New York, Poughkeepsie, and New Haven to quench the apparent conflagration.” The eruption also produced a Bishop’s Ring around the sun by day, and a volcanic purple light at twilight. Now, I ask you, fellow blog readers: why is such a cataclysmic, literally earth-shattering event not common knowledge? Why isn’t this taught in schools? Like, why the heck do I have to spend half of my high school science career learning how to operate a frikkin’ Bunsen burner while the amazing story of Krakatoa goes untold? Well, at least we have Squidward for that.